San Diego Comic Con has begun and we all know that means new and exciting film, comic and toy news will be filtering out of the convention at a fever pitch. 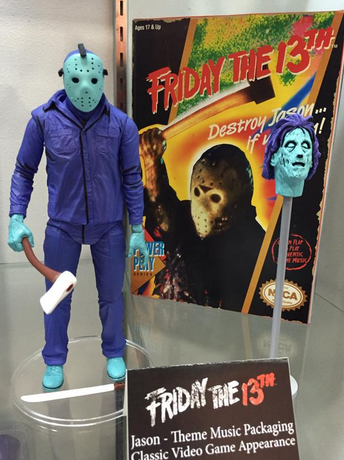 Tonight is no different as NECA has released an image of an all new NES Jason Voorhees figure for future sale! The new figure will include Mrs. Voorhees' head as seen in the infamous Nintendo game as well as a special treat; a music box packaging with the classic game music! The music plays when you open the front lid of the box. No word on price or release date yet, but we will keep everyone posted when information becomes available.